Ideally, our true self emerges in the normal course of becoming an individual, called “individuation,” so that we’re able to distinguish our own feelings, thoughts, needs, wants, perceptions, and actions, as separate from our family and others. A dysfunctional family disrupts individuation to varying degrees. Because codependency is transgenerational, in childhood a “false” codependent self is formed. See Conquering Shame and Codependency for how and why this happens. Many codependents are highly attuned to others feelings, but are in denial of their own. They may know that they’re “upset,” but are unable to name what they feel. They may name a feeling, but rationalize or minimize it, or the feeling is known only intellectually and not embodied. Often this is due to unconscious, internalized shame from childhood. In relationships, codependents feel responsible for other people’s feelings. Their focus is on their partner, and they often empathize more with their partner than with themselves. 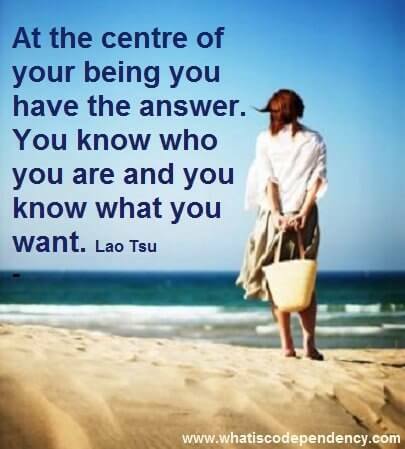 The hardest challenge for many codependents is identifying what they want. They’re so used to making others happy and fulfilling their needs and wants, including those of their own children, that they have no idea what they want. They may continue in a job or other routine behavior, but never ask themselves what more they want out of life. If they do, they make excuses and quickly feel it’s futile to make any change. Start to journal about your feelings, wants and needs. Tune in to your body. Identify sensations and inner feelings. When you’re down or uncomfortable, ask yourself what you need (See the list on Table 9-3. ), and fulfill your need. Compare a list of what you want to do and what you have to do. What stops you from doing what you want? Start doing what you want. Be authentic in your communication. Learn to be assertive. Get How to Speak Your Mind and/or the webinar, How to Be Assertive. It’s easy to slip into old habits and it may be hard to motivate yourself to follow these recommendations. Additionally, recovery can be accompanied by anxiety and depression. Some people unwittingly shift addictions or obsessions to stave this off. These are reasons why it’s so important to have a good support system, including 12-Step meetings and therapy.